It’s Halloween, and I made it back late last night. I was hoping to work on my blog while I was waiting in the airport, but I couldn’t connect to the Heathrow WiFi. I’m one of those throwbacks who doesn’t have a smart phone. And that’s my first word of advice for my literary travelers is GET A SMART PHONE and pay for short term international use if you are going to be out of the country. What few problems I had during the trip would have been helped if I had been able to communicate better. I have some serious jet lag today, but I have the weekend to recuperate and have time to catch up with my classes. My last full day in London was simply marvelous. I had a grand continental breakfast at the hotel–quite a spread. There were all kinds of pastries, including real English muffins, not the kind we eat–they are more of a spongy type of bread– and all kinds of fresh fruit, plus a variety of cold meats and cheeses. I lingered over my coffee and got caught up on some correspondence with family, students and colleagues. The hotel has a pleasant sitting room, which serves several purposes–reception, general seating, bar and breakfast room, all decorated for Halloween, which originated as the Celtic festival of Samhain. As with Christmas, eventually the pagan traditions blended with the Christian All Hallow’s Eve, the day before All Saints Day. Both pagan and Christian traditions commemorate the changing of seasons and passage from life to death, to be renewed again in the spring, with Easter, another holiday with combined Christian and pagan elements. 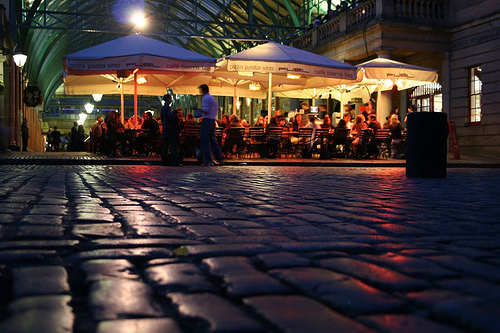 The Brits seem to love to celebrate Halloween just as much as we do, and like in the States, Halloween seems to be becoming increasingly popular with adults, with all sorts of announcements about parties at different restaurants, hotels and pubs. 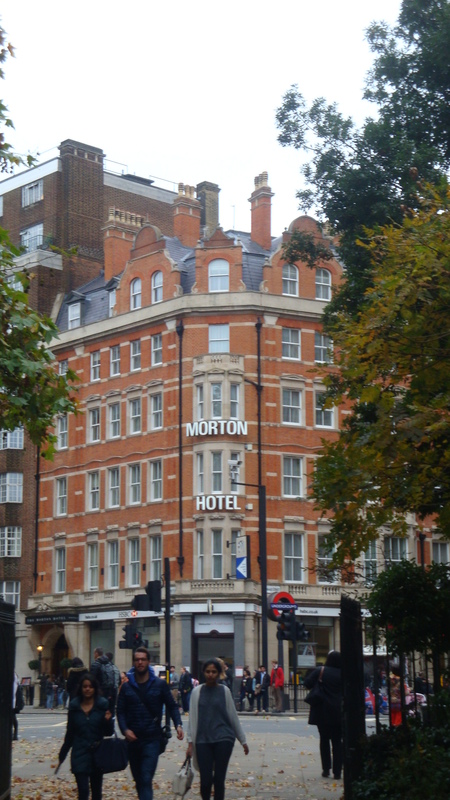 In fact, the Morton Hotel is slated to have a Halloween High Tea today. After breakfast I started off towards the first stop on my agenda–The Sir John Soane Museum. When I wrote my first sample travel project a few years ago on Georgette Heyer and her Regency novel “The Foundling,” I discovered a little gem of a museum in the house of the eccentric Sir John Soane, best known as the architect of the Bank of England, who adored his wife Eliza and was heart-broken after her death, which fits in so well with the spirit of the Regency romances written by Georgette Heyer and, of course, Heyer’s inspiration, Jane Austen. 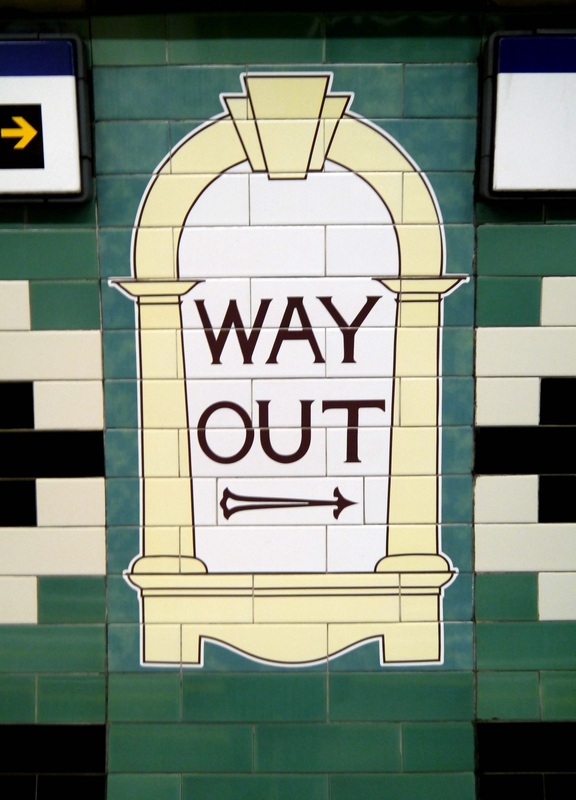 I was going to take the Underground to the Soane, but once again, the line was shut down temporarily where I needed to go, so I hoofed it, but it felt good to walk and soak in yet another area of London I had not yet explored, so I didn’t mind. 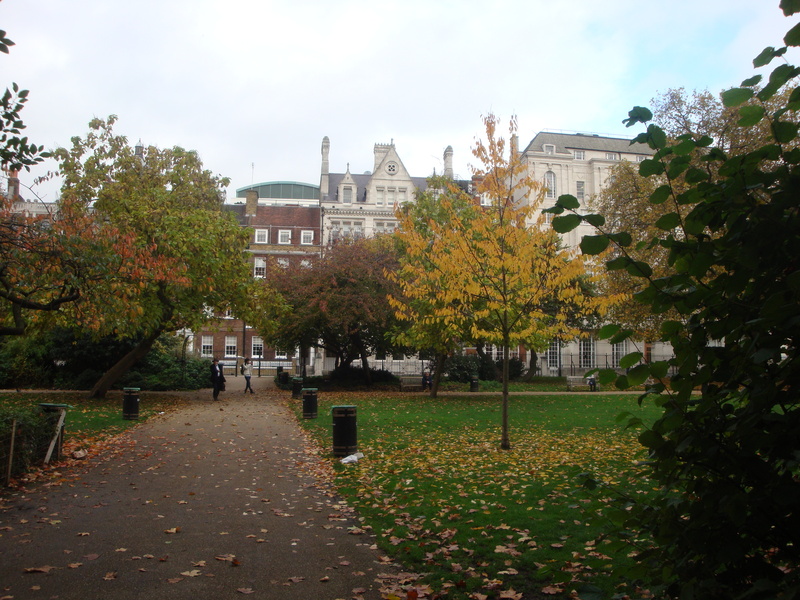 I got there early and enjoyed strolling around Lincoln’s Inn Fields, London’s largest public square, across from the museum. I took pictures there and then walked around some more and found Lincoln’s Inn itself. This incredible building is not what you think of when you hear the word inn. 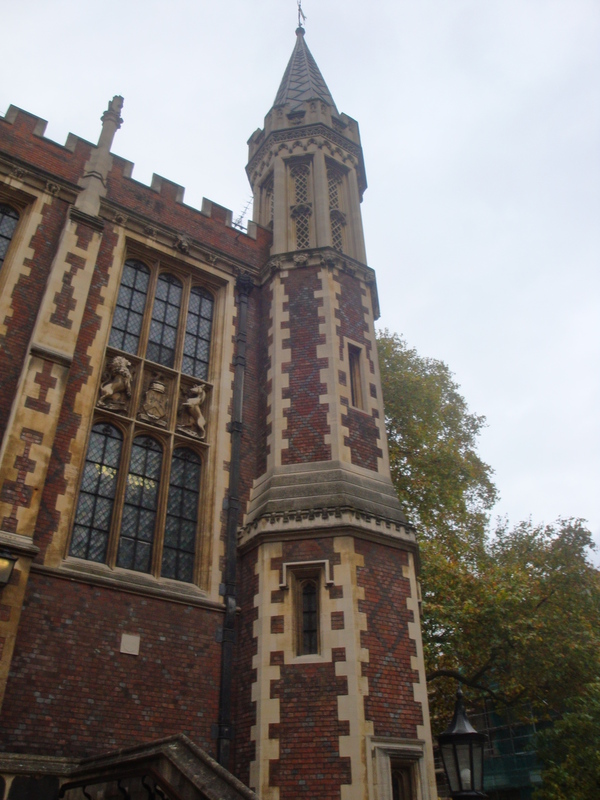 Lincoln’s Inn is the name and location of one of four legal associations that developed in the 13th and 14th Centuries, making this a good place to visit for anyone basing their literary tour on Chaucer. I could imagine the Man of Law from the Canterbury Tales being a member of this association even if the actual Lincoln’s Inn buildings weren’t built until later. Because the buildings were built in the 16th and 17th Centuries, this would also make a great place to visit if studying Shakespeare or Marlowe. The architecture is marvelous. 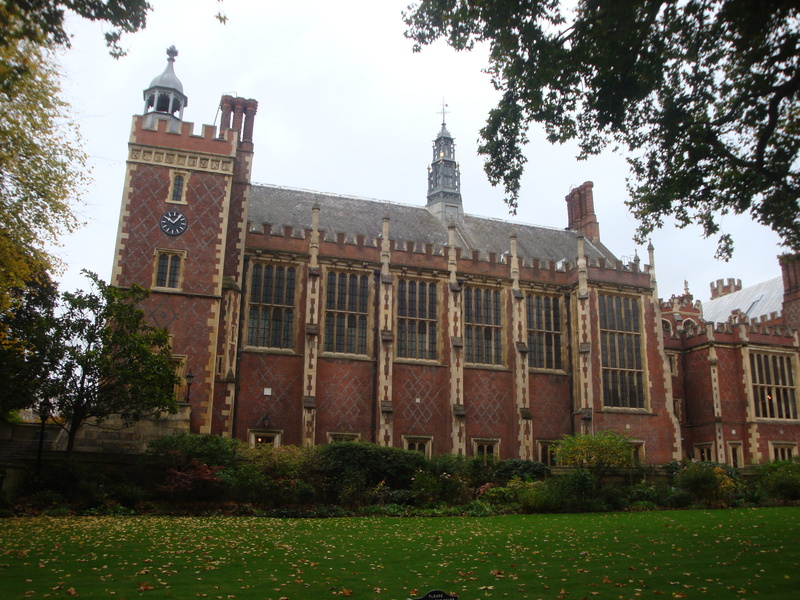 Today, Lincoln’s Inn houses the offices of many London barristers (lawyers) and includes an extensive law library. I saw one barrister going to work dressed in the traditional legal garb that British men and women of law have been wearing for centuries, although the dress code is now somewhat relaxed. 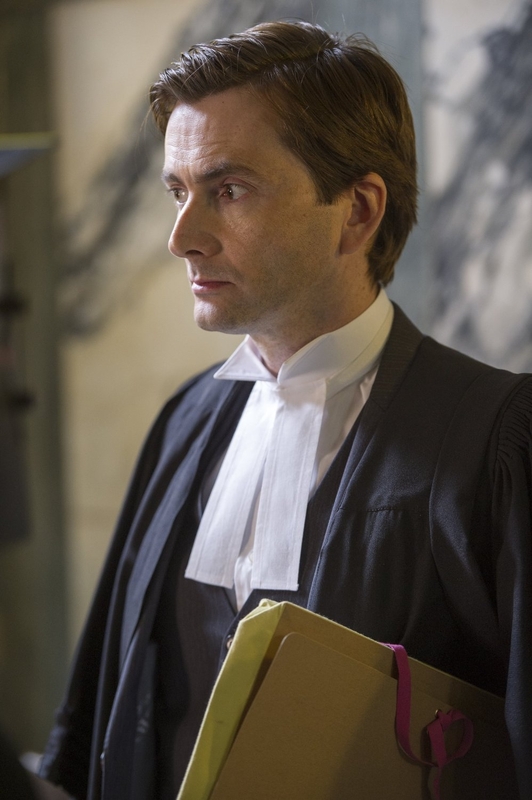 The man I saw was dressed much like David Tennant in the picture below from the movie The Escape Artist. When I made my way back to the Soane Museum, there was already a short queue forming as the hallways in the house are narrow and there are only a few people allowed in at a time. But I didn’t wait long. Entrance to the museum is free, but I bought the more detailed guide book to use as a source for my sample itinerary (I’m going to do an update sometime soon). With the book I was able to just roam around and spend as much time as I wanted in this fascinating place. Soane ran his architectural business from his home, so there was a tiny office and rooms full of architectural artifacts for himself, his clients and students to study. 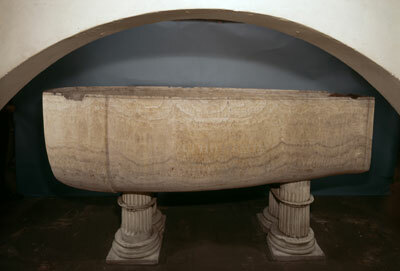 He was also quite a collector and one of the most fascinating things at the museum is a sarcophagus, a huge stone coffin, that once housed the remains of Seti, the father of Ramses the Great. One of my favorite places in the museum was the picture room. It’s a small room, so I had to wait to make my way in there. Each room has a guide who can answer questions about Soane and the house. The guide in the picture room was particularly helpful. He showed us how Soane built the room with pull out panels to hold more of his art collection in a smaller space, very clever. My favorite pieces were another series by the British painter William Hogarth, called The Election. I had seen a similar series by Hogarth in the National Gallery, and his paintings do a marvelous job satirizing life in England during the 18th Century, with that mixture of humor and pathos that is my very favorite style of writing, seen here in picture form. The guide described the series as one of the first “graphic novels” and pointed out details of the pictures and explained their historical context–really an early form of the political cartoon. After leaving the Soane Museum, I made my way to the British Museum, not far at all from my hotel. 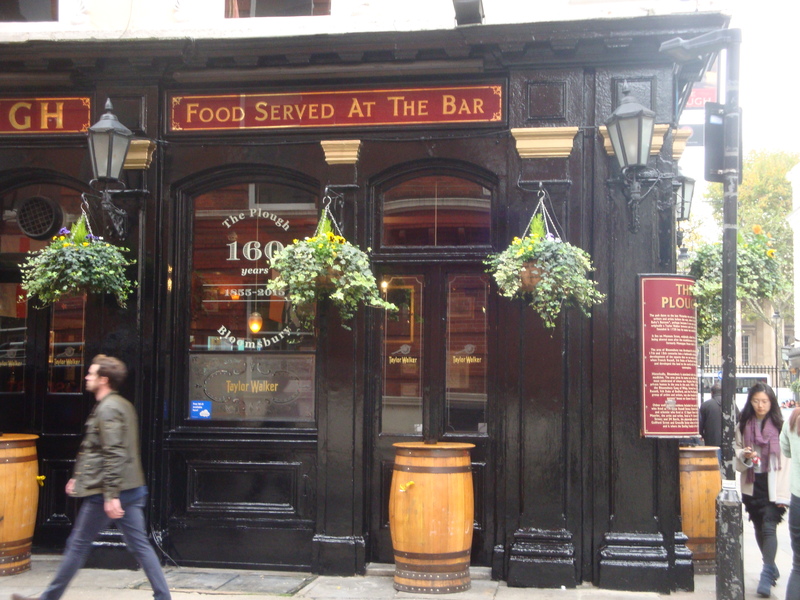 Although it was not yet noon, I was hungry, so when I passed by The Plough, a typical British pub with a plaque outside remarking how it has been frequented by British writers through the years, I decided to have lunch there. I had another typical British pie, but this one vegetarian–mushroom and onion–washing it down with a lager. It came with chips (French fries) and some tasty veggies. Hit the spot. Now it was on to the museum. 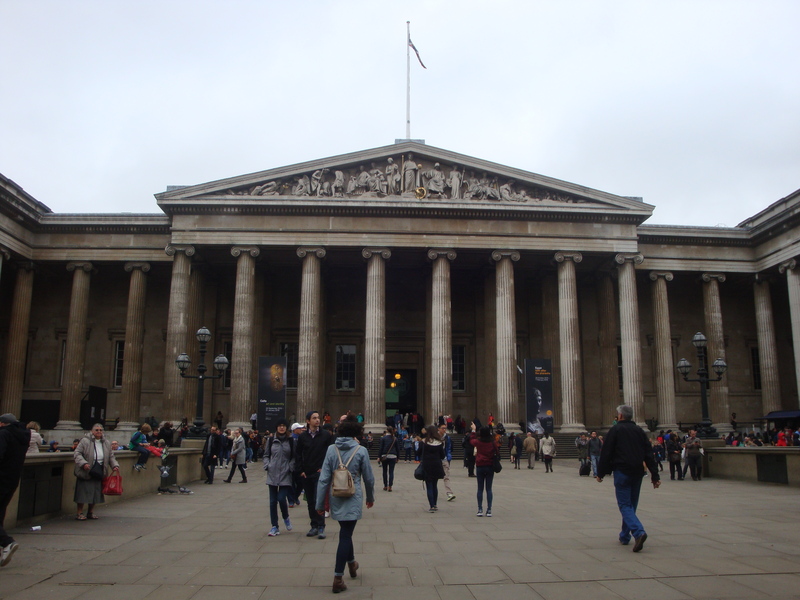 I went to the British Museum, also free admission, on my trip in the summer of 2011, but the place is so huge that it would take many visits just to see the permanent collections. 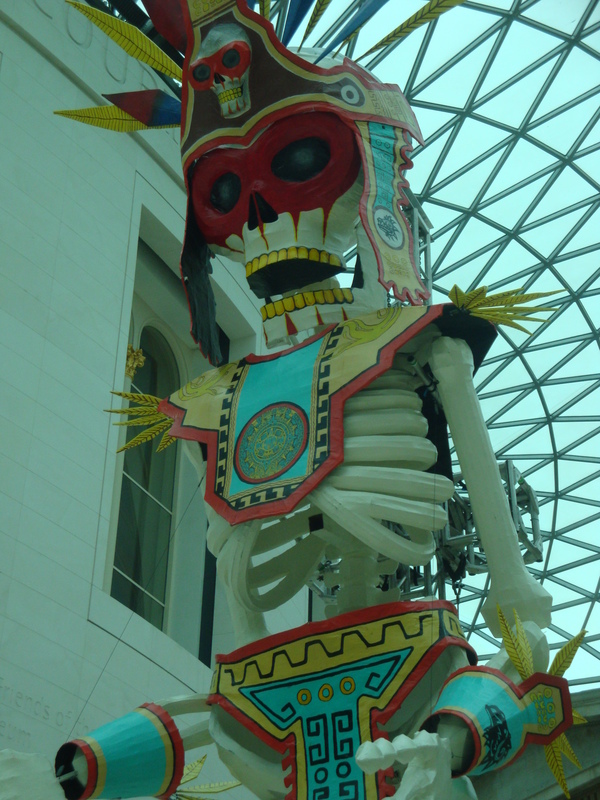 I was greeted by huge skeletons like the one above in the courtyard and a big skull along with a skeleton in the atrium area where the Rosetta Stone is displayed, but I passed quickly by them. I wanted to focus my visit this time on the literary and old European collections, and I’m glad I did. Anybody doing any literary tour about a British author should plan to include the British Museum in the itinerary because it covers all aspects of British history and because so many authors have been influenced by items in the museum. 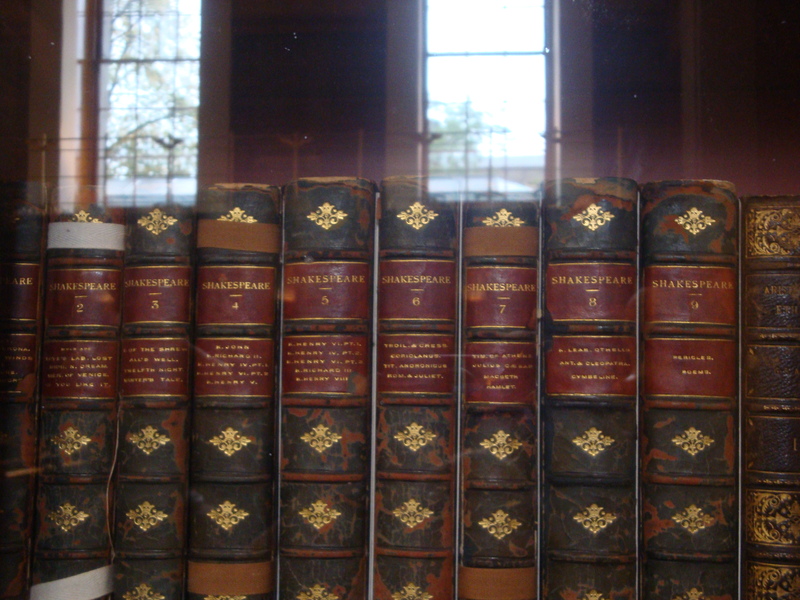 One of the first rooms I went in includes selections of hundreds and hundreds of old books, including the beautiful editions of Shakespeare seen here. Then, in the old European room, I hit the jackpot, finding and photographing many artifacts from the burial ship found unearthed at Sutton Hoo, believed to date back to the time of Beowulf. 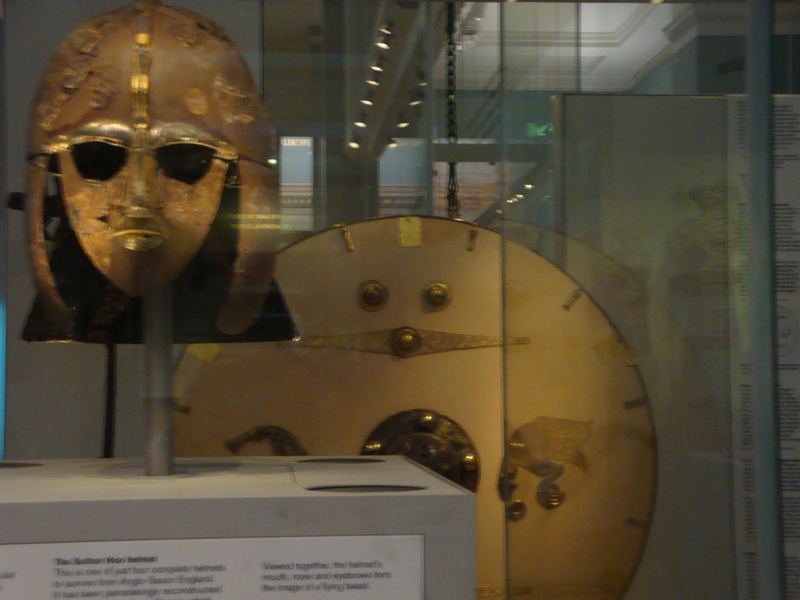 Most fascinating to me were the helmets, swords and shields. 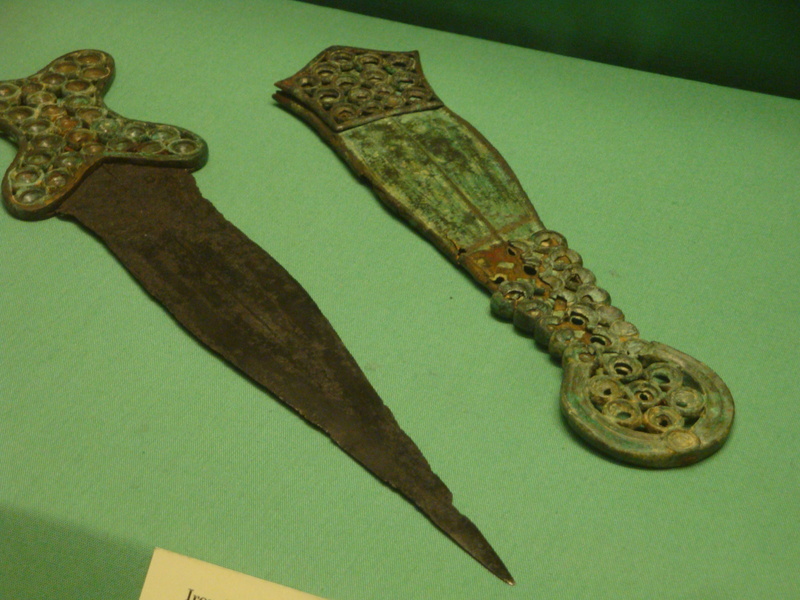 Could Beowulf have used a dagger like this? 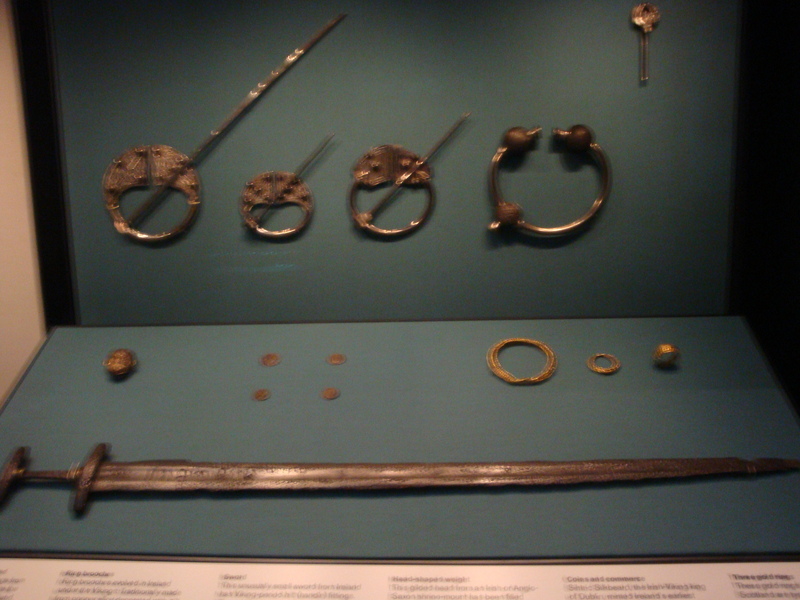 In another room were marvelous examples of Celtic art, including crosses and the large ornamental brooches seen to the right. Anyone doing a project on Dream of the Rood, Beowulf, Lanval or any of the early British works would appreciate these rooms. I could have spent hours and hours at the British Museum, but I was getting a bit weary and had a big night ahead, so I went back to the hotel, caught up on some more work and took a nap. Good move. Naps, if not too long, can really help travellers get the most out of their visits. I had some tea and a biscuits (shortbread cookies) in the room and headed out early to get to the Savoy Theatre, next to the famous Savoy Hotel on the Strand, another vibrant section of England that was really hopping that night, even though there was a steady drizzling rain. Londoners and tourists alike have learned to adapt to the rain, which comes and goes frequently. As I passed through Covent Garden on my way to The Strand, I noticed people sitting outside under canopies, seated around these little outdoor fire grates, laughing, talking and ignoring the rain. I arrived at my destination early, so I walked up and down the Strand, soaking in the atmosphere (no pun intended, but I did forget my umbrella the one time I needed it). I bought a soda at a little kiosk and headed back to the theater to wait some more, but boy, oh, boy, was it worth the wait. 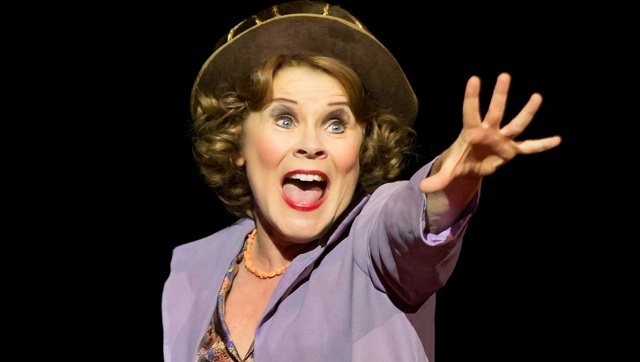 I’ve seen Gypsy several times, and I was an assistant stage manager for a community theater production of it, so I know the show very well, but this was hands down the best production of it I have ever seen or been a part of, mainly because of Imelda Staunton as Rose, who was simply astounding. Some of the best acting I’ve ever seen and the lady has pipes! The final scenes between Gypsy and Rose were everything they were meant to be and the final number, Rose’s Turn, was the final release of all the pent up anger and resentment of a woman who has spent too long living her life for and through her children, not realizing the damage she was doing to herself and all the ones she loved. It was heartbreaking and triumphant. It was so real. I don’t know how anyone can act like Imelda did that night. Simply amazing! Then, in the final scene, Gypsy comes on stage and Rose breaks down again–finally humbled and remorseful, a broken woman as she leaves the stage, and her daughter’s last gesture, a simple arm over her mother’s stooped shoulders, just said it all. I was also thrilled to see Peter Davison, who played the role of Herbie, Rose’s friend and would be husband, who loves Rose despite everything but has to leave her in the end. It was a special treat seeing Davison, whom I had a crush on when I was a teenager and loved to watch him play Tristain in the British TV series All Creatures Great and Small. He also was one of the many actors to play Dr. Who (the 5th doctor). It was a great way to end my last night in London. I didn’t even mind the walk back in the rain and the crowded subway as I made my way to Russell Square. I stopped one last time at the Tesco’s and bought supplies for a midnight snack and some breakfast before going to my room. They were still showing all the Harry Potter movies, so I watched Imelda Staunton again as Dolores Umbrage in the final Potter movie while I had my snack and checked e-mail. The final day was all about travel. I left the hotel pretty early after getting all packed up because I also like to arrive early and wait rather than rush and worry about missing my plane. I discovered that because I had an oyster card and had bought an extension to London when I arrived that I didn’t have to pay any more. I also discovered that I had paid a 5 pound deposit that can be returned with any money you do not spend when traveling, if any. If you prefer, you can keep your Oyster card, and it is still good when you return to London. I definitely recommend an Oyster card if you are going to spend any time in London. 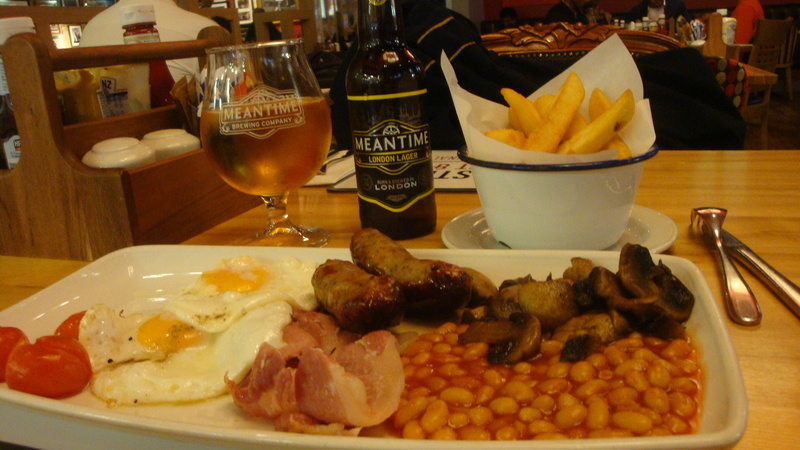 Once I got to the airport, checked in and got to the correct terminal, I had my last meal in England, a traditional English breakfast washed down with an English lager. This time I had the beans but still didn’t try the black pudding. I’m not that English! The trip was uneventful from then on out. It was a long trip back, but it was totally worth it, and gave me a better understanding of the country, people, history and literature of England, which is important to all Americans because we share a language and England is our mother country, one of our best friends in the world today. I hope you have enjoyed my blog posts about my trip to London. 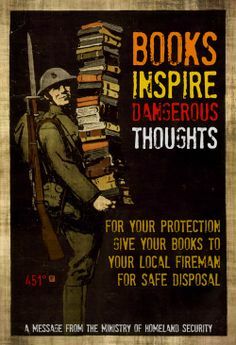 I have learned so much and am so looking forward to using what I have learned to improve my instruction of not only my British literature courses, but all of my classes. Cherrio and Mind the Gap!!!! Because of the change in time, I arrived in London about 11:00 this morning. I met up with my old high school friend and we took the Underground to Russell Square. Our hotel, the Hotel Russell is an old Victorian hotel. It’s gorgeous! My room is small and my view is of back alleys and people’s back yards, but I find it charming. For students working on travel projects going to London, I suggest looking into purchasing an Oyster card. A seven day card gets me unlimited travel on two central zones on the subway, called the Tube by Londoners. It took a while to get from Heathrow to Russell Square, so we didn’t have but a little while before going to the theatre (British spelling). We were pretty tired, so we decided to take a taxi, which I wouldn’t advise if you are making plans to travel in London. Because the traffic was so snarled and the cabs charge by the minute, it turned into a pretty penny, but we got to the Garrick Theatre with plenty of time to spare. Found this on trip advisor, but we were sitting near the end of this row! 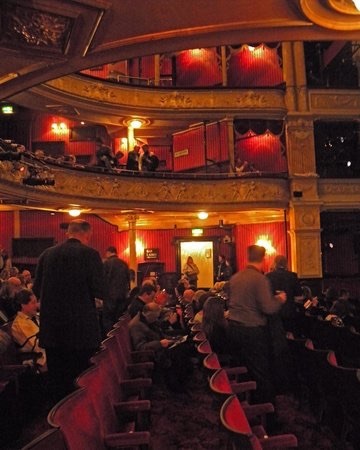 The Garrick is an old theatre for which The famous Irish actor Kenneth Branagh is now artistic director. 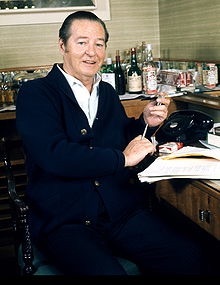 The show was two one acts by the important British playwright Terence Rattigan. The first short play starred the great British actress, Zoe Wanamaker in a one woman show called All on Her Own, about a woman who has recently lost her husband. It was some great acting, but the pace was kind of slow for someone with jet lag. The longer one act was an unexpected pleasure. Also by Rattigan, it was totally different in character. It is a funny farce about theatre. Very funny, and I was thrilled that the play is directed by and starring Branagh. Wanamaker was in that show too. Very funny, brilliantly acted, yet also rather poignant and touching at the end. I absolutely loved it! Another thing for London travelers to remember is buy snacks and drinks from one of the little groceries that are all over because it is much cheaper than at the hotel bar and many London hotels don’t have vending machines. Well, it is late and I didn’t sleep much on the plane, so I am going to hit the hay. I will write more tomorrow. Professional development–It means different things to different people, I suppose, but in my mind, I will soon be experiencing the most wonderful professional development a teacher of British literature could ask for. I’m going to England! One of the highlights of the trip will be seeing Benedict Cumberbatch performing the leading role in Hamlet at the Barbican in London. The timing is perfect because while I am there, seeing Hamlet live, my students will be reading Hamlet and watching a movie version of it. I wish I could take them with me, but I plan to do a video pre and post show in front of the Barbican and take as many pictures and videos as I can to use in my British literature classes. I also plan to use my experiences to continue to refine the major capstone project in my online literature classes–the literary travel project that I have discussed in previous blogs. I have created sample literary travel projects, and now I can test out my own literary travel plans to further refine those samples, as well as the project directions, and help my students get the most out of their major research project. Keeping up with all of my classes, seated and online, will be a challenge, but I thought one way to stay in touch with them, and with anyone who is interested in the value of international travel as professional development for faculty. 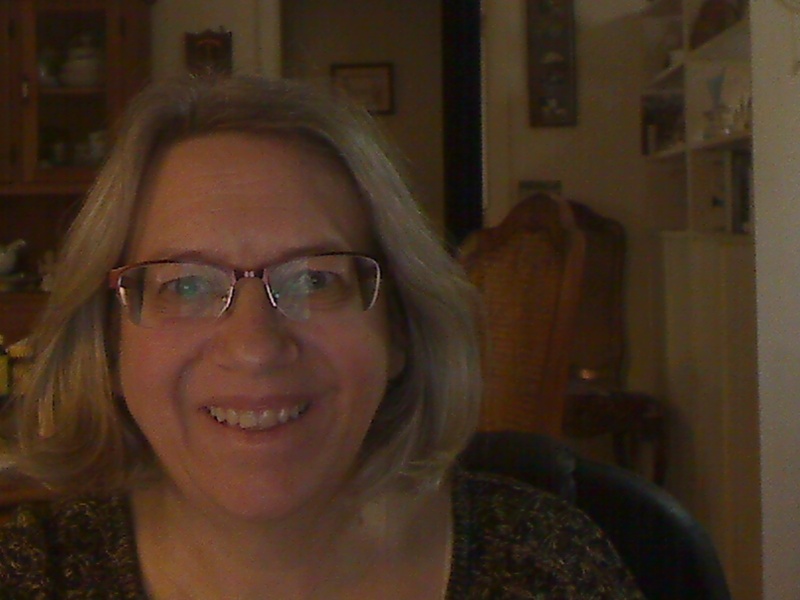 will be interested in my blog posts over the week–STARTING ON FRIDAY, OCTOBER 23!